Receive a heartwarming welcome at Phuket International Airport in Phuket. Transfer to hotel by our representative. Be at leisure in the hotel. Stay overnight at hotel/resort in Phuket. Start your morning with a healthy breakfast. Explore the glorious city of Phuket with its Portuguese style edifices and vibrant markets. 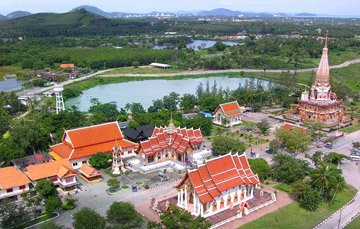 Proceed to visit the prominent temple Wat Chalong, Rawai Beach – the mesmerizing sea-coast, Sea Gypsy Village and Cape Promthep. Stay overnight at the hotel/resort in Phuket. Have a healthy breakfast in the morning and travel to Phi Phi Island. Explore the enchanting island with its incredible natural brilliance and unique beauty. Start your day with a savory breakfast at the hotel. Enjoy some last minute shopping at the vibrant market of Phuket Island. It is best known for its cultivated pearls, batiks, pewter ware etc. Transfer to the Airport for Bangkok. Receive a warm welcome at Bangkok airport. Transfer to hotel. Start the second last day of your trip with a healthy breakfast in the hotel. 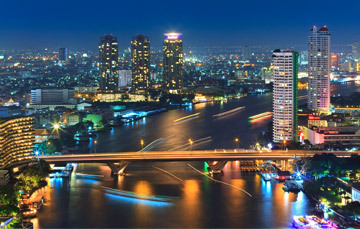 Explore the capital city of Thailand with its glorious temples: Golden Buddha Temple (Wat Traimit), the Reclining Buddha Temple (Wat Po). Enjoy shopping or being at leisure in the rest of the day. Check-out from the hotel post-breakfast. Transfer to hotel to have the departure flight from Bangkok.